A Pakistani court today ordered the release of Hafeez Muhammad Saeed, founder leader of banned Lashkar-e-Toyaba (LeT), on the ground the government had failed to provide strong reasons for his arrest. Ten-year-old Mithia knows nothing about basic hygiene. 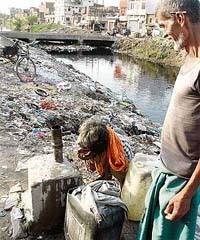 Parked in a makeshift tenement along the banks of the Budda Nullah beyond Chand Cinema, he coughs incessantly. Himachal page: Sutlej or dumping ground? The 990 MW Beas Satluj Link, managed by the Bhakhra Beas Management Board, has been shut down indefinitely as one of the six shaft seals that confines water inside the water conductor system and lubricate shaft, burst suddenly at around 10 pm last night, submerging the three floors of the Dehar power house, including generators and electronic motors and transforms under water completely. 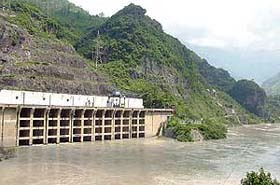 The electricity generation in the 990-MW Dehar power house was stopped as the water of the Sutlej submerged three of its floors on Sunday night. The HRCP's worst fears and predictions have come true. The military establishment made its intentions of pursuing, hunting and killing Nawab Bugti and other Baluch nationalists quite clear. A cloudburst in Dhar Kansi near here played havoc in the wee hours today. It triggered a big landslide a km from here on National Highway-21, washing away five vehicles and killing three persons. Hundred of passengers were stranded on the national highway-21 till 11.30 am when the PWD cleared the blockade. Around 85 per cent of the rice procured by the FCI in Punjab and Haryana in some cases during the period 2000-05 was “beyond rejection limit” (not fit for human consumption), according to the Comptroller and Auditor General of India. The Delhi police today claimed to have seized a huge consignment of a banned drug worth Rs 200 crore from a container depot in the Badarpur area of South Delhi near the Delhi-Haryana border. 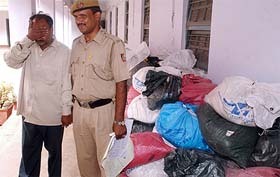 Vinod Sharma (left) covers his face as he stands next to the seized sacks of the banned drug mandrax at a police station in New Delhi on Monday. In an apparent attempt to capitalise on the recent political controversy over the compulsory singing of Vande Mataram, the BJP today asked its party units across the country to recite the National Song at state and district headquarters on September 7.